Total area: 16579 sq. kms. 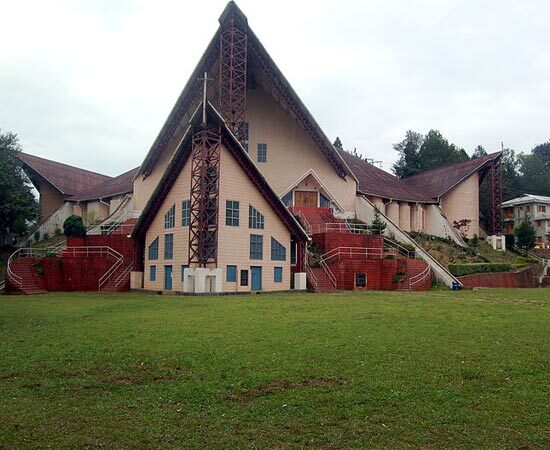 The Diocese of Kohima comprises the State of Nagaland covering an area of 16,579 sq. kms. with a total population of 1,990,036 The literacy rate is 67%. The Catholic population is 60,563 spread over 37 parishes and 15 mission centres. There are 16 major tribes speaking as many languages. Today there are Catholic communities practically in all the major tribes. The Angami and Lotha tribes have the largest communities. The attempt to preach the good news of Jesus Christ in Nagaland by the Catholic Church goes back to 1908 when Fr. Marcellinus Molz reached Tamlu in Mokochung District. But this first visit of a Catholic missionary to Nagaland could not bear the desired fruit. Nagaland had to wait another 40 years more before the next opportunity arrived. That was in December 1948 when a group of Spanish Sisters – Sr. Margarita and Sr. Gaudalupe of Sisters of Christ Jesus - and a Catholic priest, Msgr. Bars, SDB., arrived in Kohima to offer their services to the newly established Naga Hospital of Kohima at the request of Mr. Akbar Hydari, the then Governor of Assam. They were strictly forbidden to do any evangelizing activities. When the sisters had to leave the hospital in 1952, Fr. Marocchino, SDB., who by then had replaced Msgr Bars, was allowed to continue his stay in Kohima, but he had to quit the hospital premises. After much wandering about he was able to build a hut of his own in a corner of the Kohima Village and he paved the way for the growth of the Catholic Church in the Angami area. In the meantime, the Catholic faith began to take root in another part of Nagaland, among the Lotha tribe, who were close to Assam. In 1950, some Lotha Baptists from Lakhuti village contacted the catholic priests at Golaghat and received Baptism in April 1951. Soon it led to the establishment of a catholic community in Lakhuti village in spite of stiff opposition from the Baptists. The Diocese of Kohima was part of the Diocese of Dibrugarh until 1973 when the states of Nagaland and Manipur were separated from the Diocese of Dibrugarh and made into the Diocese of Kohima-Imphal. Late Bishop Abraham Alangimattathil, SDB., the then Vicar General of the Diocese of Dibrugarh, was appointed as its first Bishop. On June 29, 1980 the Diocese of Kohima-Imphal was bifurcated and the Diocese of Imphal was carved out of it comprising the State of Manipur. Bishop Abraham Alangimattathil, SDB, continued to be the Bishop of the Diocese of Kohima comprising only the state of Nagaland until his resignation on 11th July 1996 due to ill health. Fr. Jose Mukala, the then Vicar General of the diocese was elected as the Administrator of the Diocese by the diocesan consultors. Bishop Abraham after a commendable and untiring service of nearly 23 years to the diocese succumbed to death on 18th Novemeber 1997 due to a sudden Cardiac arrest. On December, 9, 1997 Rome announced the name of Fr. Jose Mukala as the Bishop-Elect of the Diocese of Kohima. Bishop Jose Mukala served the Diocese of Kohima for twelve years until his resignation on 30 Oct. 2009. Then the diocese was placed under the care of the Apostolic Administrator in the person of Archbishop Dominic Lumon until a new Bishop was appointed. The Vatican made the announcement of the election of Fr. James Thoppil, the then Rector, Oriens Theological College, Shillong, as the new Bishop of the Diocese of Kohima on 16 June 2011. Fr. James Thoppil was ordained a bishop on 8th September 2011 at the Cathedral Church, Kohima by His Grace Most Rev. Salvatore Pennacchio, the Apostolic Nuncio of India, in the presence of other bishops of the Region and he took charge of the diocese on the same day.